Pizza. Even when it's bad, it's still pretty good. 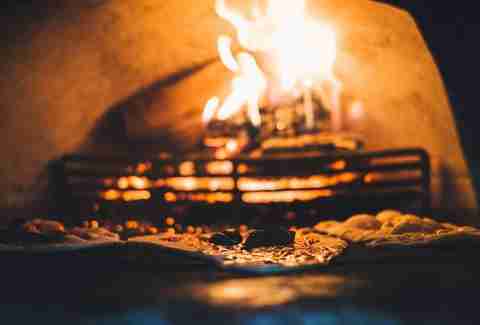 And even when it's good, it can still be unjustly overlooked by the pizza-reviewing community at large who, as we all know, tend to focus their adoration on but a few select spots like Franco Manca, Pizza East, Homeslice, and the Pizza Pilgrims. 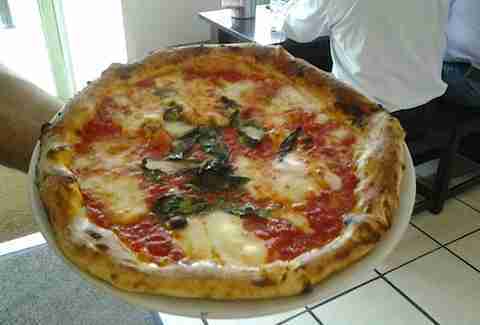 So, in our ongoing quest to bring a little justice to the table, we've lined up the best pizza joints that aren't mentioned on almost anyone's "Best Of" lists -- including Time Out, The Standard, or even our own rundown. This slightly industrial space may not look like a place that does legitimately good pizza, but remember what your mum told you about judging books by their covers. Boasting speedy (approx. three mins! 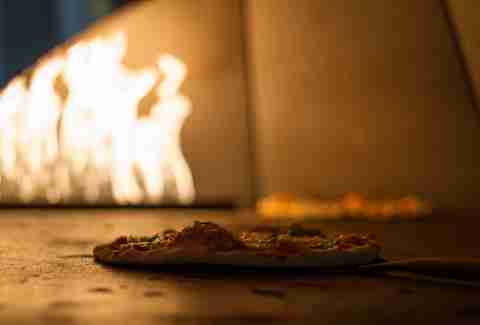 ), fresh, oven-baked, thin-crust pizza, a solid menu, a good range of booze, and open till 11pm, these guys are also ridiculously cheap, with the most expensive 'za coming in at a mere £6.50. What you're getting: The Calabria will fire you up and calm you down with spicy n’duja sausage and mascarpone. Having been in the pizza game since 1959, Silver Dollar seems to really like to fly under the radar, however it routinely gets hunted down by A-listers and pizza lovers alike. The decor hans’t changed in 50 years, and the staff keeps things straight forward. 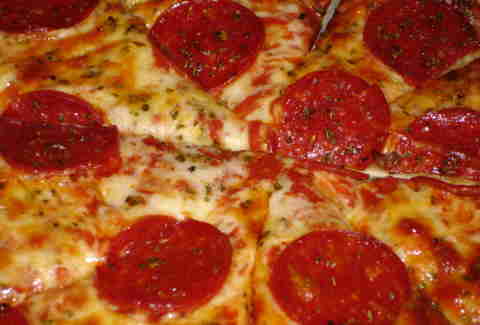 What you're getting: Go for the basic pepperoni pizza on a super-thin, crispy crust. Simple, but incredible. 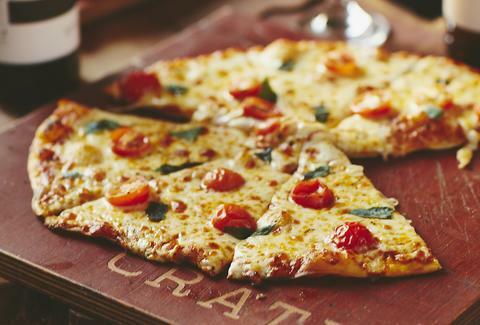 Never was a marriage better then that between beer & pizza, and the guys over at CRATE are fully supporting their union. 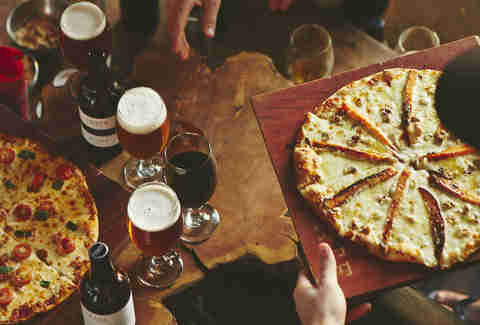 Grab a glass of their house-brewed beer, find a spot with a view of the canal, and order one of their unusually topped pizzas -- they've certainly upped their game since they opened. What you're getting: The Sweet Potato, Stilton & Walnut sounds strange, but is delicious. This family-run bakery takes its dough very seriously. It actually closes Mondays and Tuesdays in order to give the bread starters time to rest & regrow. As a result, its sourdough pizzas are pretty much a work of art. 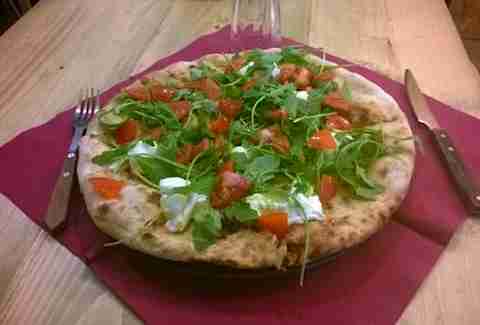 What you're getting: The Fumé, w/ mozz, tomato sauce, rocket, speck & shaved Parmesan is a house favourite. Owners Stefano & Nadia must have brought some kind of pizza wichcraft from their native Capri, because their little pizzeria has people swiftly developing addictions. With simple flavor combos, they hit the spot with the Gorgonzola & Noci with mozzarella, Gorgonzola, speck, Parmesan, and basil baked off in their wood-fired oven. 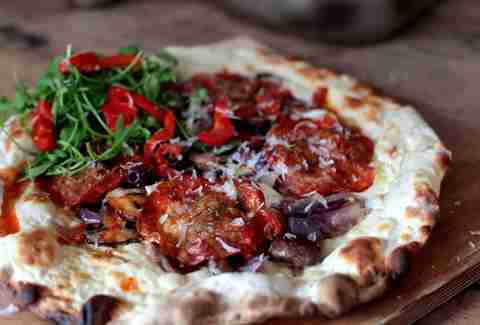 In the Neapolitan pizza capital of London (that's Streatham for... some reason), a group of siblings has created some of the thinnest pizzas in London, but still loaded them with toppings. They seriously know how to work that dough. The dining room is tiny, so people fill the pub across the street waiting for their turn. Although some like to say this is more of a flatbread then a true pizza, others will just as passionately argue that it’s the best pizza in London. The base is flash baked to a crunchy consistency, which goes against what we have embraced with the recent influx of Neapolitan style, but is still nevertheless insanely pleasing to the tongue. What you're getting: Grab a Fico with goat’s cheese, fig & olive tapenade, fresh red onion, capers & thyme with fresh salad leaves, Parma ham & a splash of aged balsamic vinegar. 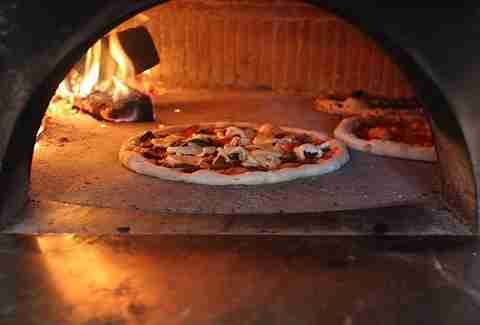 Slinging their sourdough goods from a roving vintage Citroen van outfitted w/ a hot, clay, wood-fired oven, Well Kneaded is fast becoming one of the capital’s best pizza makers. Their bases are thin, oddly shaped (almost never perfectly round), and they’re topped with fresh, ever-rotating toppings. What you’re getting: If the menu includes the chorizo/pointed pepper/cheddar number, go for that.